New technologies offer a rich variety of ways in which learners can interact, prescription communicate and collaborate, however both learners and teachers need to develop a complex set of digital literacies in order to harness the potential of these media. This edited collection is an output from a DIVERSE conference held at Dublin City University in 2011. 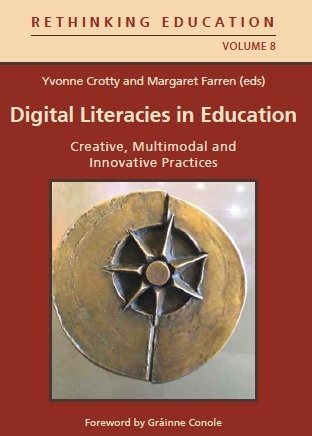 It is an authoritative work outlining different strands of digital literacy research and is timely given the increasing impact that technologies are having on Education. It covers both theoretical discourses on the topic, along with practical empirical studies of the use of different technologies, such as podcasts, mobile devices and virtual worlds. Yvonne Crotty sets the scene for the book in Chapter 1, describing the origins and focus of the DIVERSE 2011 conference, which included keynotes from two eminent speakers, Michael Wesch and Roy Pea. In Chapter 2, Micheal Wesch provides a philosophical account of the impact of new media and the means in which social and participatory media enable us to actively engage, interact, communicate and collaborate, or as he states ‘We were celebrating empowerment, new forms of connection and community, and new and unimaginable possibilities. He states that this is not just a technology revolution but also a social one. Despite this potential his research and the research of others show that students are not extensively engaging with this media and lack the critical literacy skills to make informed judgments about the relevance of resource they find for their own studies. Roy Pea and colleagues focus on a study for fostering collaborative learning through the use of digital video technologies for collaborative knowledge constructive in a classroom. The study provided evidence of how to improve guidance for student teams solving a complex authentic task for History. In Chapter 4, Vance Martin describes the use of wikis to foster democratic teaching. He uses an action research approach and draws in particular on the work of Vygotsky, Lave and Wenger and the concepts of social production and the open source movements. He concludes that ‘[Technologies] can offer all students the chance to find their voice, and become creators in their own education’. In Chapter 5, Theo Kuechel plots the evolution of audiovisual technology over the last sixty years and in particular the potential shift of the use of these media from one-way presentation to the promotion of different pedagogical approaches. He describes a pedagogical model developed as part of a JISC-funded project, which consisted of the following elements: watch/observe, analyse/predict, empathise, create, share/publish and collaborate. McNeill and Azriel also argue that we are witnesses to a global communication revolution in Chapter 6. They describe a study using cell phones for journalism with a group of communication students. They used the phones to gather data on a new item and to produce a newspaper style article. In Chapter 7, Williams focuses on Visual Educational Resources. He argues that ‘Visual content can be harnessed to enliven our classes, provide illustrative examples, and enhance learning.’ He summarises the work of Hariman, Lucaites and Finnegan on the power of visualisation. He concludes by arguing that we need to help students develop visual literacies in order to participate in today’s media-rich environment. Crotty and Farren, the editors of the book, describe the development of Information and Communication Technologies at Dublin City University, in Chapter 8. The chapter begins by describing the Irish Government’s policies on ICT in education over the last twenty years or so. They go on to describe the establishment of the Centre for Teaching Computing at DCU, along with a Masters in Computer Applications for Education. In Chapter 9, Whitehead focuses on Self-Study of Teacher Education Practices (S-STEP), drawing on Schon’s research. He concludes by stating that ‘the generation and legitimation of living educational theories takes place in contexts that have been influenced by different historical traditions and sociocultural influences and that these contexts are in a constant process of transformation’. Virtual Worlds are the focus of Fitzsimons’ Chapter 10. Her interest is on understanding immersion in virtual worlds and the stages one moves through: from separation, through transition and finally transformation. She describes her own experience using an ethnographical approach. She argues that it is a challenging and experiential learning process. In Chapter 11, Geng and colleagues describe the development of podcasts at Oxford University; the initiative was built on Oxford’s initial developments from 2008. In particular there were a number of shortcomings identified with the then approach to developing podcasts, namely: remoteness of contributors, scattered hosting and split collection interfaces. The JISC-funded OpenSpires project aimed to address these and to establish a rich Open Educational Resource repository. Evaluation of the resource indicated a number of benefits: motivating distance learners, supporting existing students, helping teachings in their professional development and reuse in the classroom. Rolf and colleagues describe a lecture capture system developed at the University of Osnabruck in Chapter 12 and in particular a project funded by the Mellon foundation, Matterhorn, which involved 13 partners. In Chapter 13, Dougherty and Massanari outline best practices for bloggers. They begin with an overview of the type and purposes of different blogs, ranging from personal diaries through to information portals. The chapter provides a useful set of tips and hints for creating and maintaining blogs. In a postscript to the book, Vanbuel and Reynolds describe the establishment of the MEDIA awards scheme in 2007, which aimed to recognise and reward excellence in media to support learning. What I particularly like about this book is the rich set of empirically based examples of the use of different technologies to promote different pedagogical approaches. Together they give an excellent picture of the potential of new technologies for education, but also demonstrate that both teachers and learners need to develop a complex set of digital literacies in order to harness this potential. Providing practical examples (as given in this book), along with more structured guidance for the design of learning interventions, are the means of achieving this. As Wesch states in Chapter 2, we are posed in a revolution in education. Technologies truly have the potential to transform; the question is, are we as teachers ready to embrace this potential? You are currently browsing the e4innovation weblog archives for August, 2013.